Join us for fun and activities at 10 am with the Easter Egg Hunt starting promptly at 11 am. We are once again sharing the hosting duties with Trinity Lutheran Church & Preschool and the Mount Vernon Presbyterian Church. Hope to see you there! We meet each Sunday at 9:15 a.m. in the Rees Room for "Little Church" with Gary. This is a time when children age 3 through 6th grade gather to share a prayer time, learn "The Lord's Prayer", collect offering (currently we are giving our offering in support of The Mawingu Project in Tanzania), and sing a couple of songs. Then we move into our classrooms... all are welcome! We have classes for children aged Preschool through 12th grade. We are offering a Confirmation Class to our students in 6th through 12th grade. PS: If you want to fill out your registration/permission form for the upcoming year electronically, just click this link. Feel free to just fill out the form, print it, sign it and bring it to the church. Thanks! 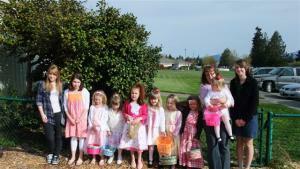 Check out the slide show of our Sunday School children planting their bed in our community garden! Nursery is available for younger children. If you would like more information on our Sunday School program please contact Lori Flores at lori@mvfumc.org. Safe Church Policy... Our church follows a "Safe Church" policy for all paid staff and volunteers that work with children and youth at our church. All workers with young people have passed a National Background Check run through Intellicorp. If you would like a copy of our Safe Church Policy, please contact Lori Flores in the church office lori@mvfumc.org or 360-424-3628.